When NASA's New Horizons sped past Pluto on July 14, 2015, it took the best-ever pictures of the rocky world s surface, giving us new insight into its geology, composition and atmosphere. These stunning images are the most famous result of New Horizons, but the spacecraft also sent back over three years worth of measurements of the solar wind the constant flow of solar particles that the sun flings out into space from a region that has been visited by only a few spacecraft. This unprecedented set of observations give us a peek into an almost entirely unexplored part of our space environment – filling a crucial gap between what other missions see closer to the sun and what the Voyager spacecraft see further out. A new study to appear in The Astrophysical Journal Supplement lays out New Horizons observations of the solar wind ions that it encountered on its journey. 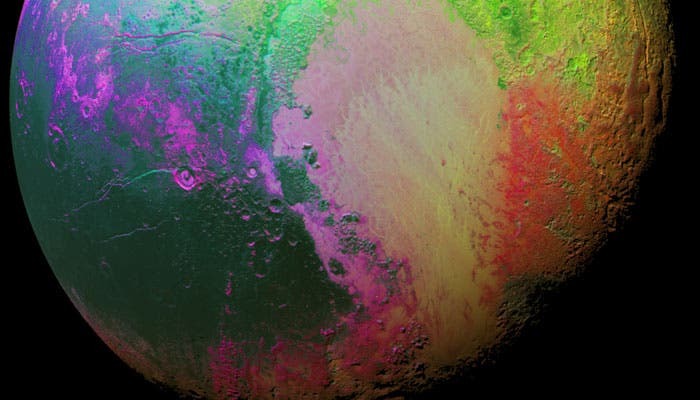 Not only does the New Horizons data provide new glimpses of the space environment of the outer solar system, but this information helps round out our growing picture of the suns influence on space, from near-Earth effects to the boundary where the solar wind meets interstellar space. The image below shows the simulated space environment out to Pluto a few months before New Horizons' closest approach. 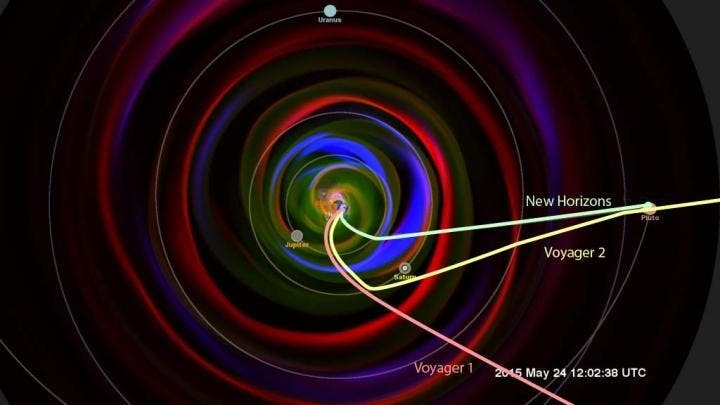 Drawn over the model is the path of New Horizons up to 2015, as well as the current direction of the two Voyager spacecraft – which are currently at three or four times New Horizons' distance from the sun. The solar wind that New Horizons encountered will reach the Voyager spacecraft about a year later. The new data shows particles in the solar wind that have picked up an initial burst of energy, an acceleration boost that kicks them up just past their original speed. These particles may be the seeds of extremely energetic particles called anomalous cosmic rays. When these super-fast, energetic rays travel closer to Earth, they can pose a radiation hazard to astronauts. Further away, at lower energies, the rays are thought to play a role at shaping the boundary where the solar wind hits interstellar space – the region of our solar system that Voyager 2 is currently navigating and observing. Though space is about a thousand times emptier than even the best laboratory vacuums on Earth, its not completely devoid of matter the suns constant outflow of solar wind fills space with a thin and tenuous wash of particles, fields, and ionized gas known as plasma. This solar wind, along with other solar events like giant explosions called coronal mass ejections, influences the very nature of space and can interact with the magnetic systems of Earth and other worlds. Such effects also change the radiation environment through which our spacecraft and, one day, our astronauts headed to Mars travel. The instrument was only scheduled to power on for annual checkouts after the Jupiter flyby in 2007, said Heather Elliott, a space scientist at the Southwest Research Institute in San Antonio, Texas, and lead author on the study. We came up with a plan to keep the particle instruments on during the cruise phase while the rest of the spacecraft was hibernating and started observing in 2012. This region is billions of cubic miles, and we have a handful of spacecraft that have passed through every decade or so, said Eric Christian, a space scientist at NASAs Goddard Space Flight Center in Greenbelt, Maryland, who studies what's called the heliosphere the region of our solar system dominated by the solar wind but was not involved with this study. We learn more from every one. Since the sun is the source of the solar wind, events on the sun are the primary force that shapes the space environment. Shocks in the solar wind which can create space weather, such as auroras, on worlds with magnetic fields are created either by fast, dense clouds of material called coronal mass ejections, or CMEs, or by the collision of two different-speed solar wind streams. These individual features are discernible in the inner solar system but New Horizons didnt see the same level of detail. "At this distance, the scale size of discernible structures increases, since smaller structures are worn down or merge together," said Elliott. It s hard to predict if the interaction between smaller structures will create a bigger structure, or if they will flatten out completely. 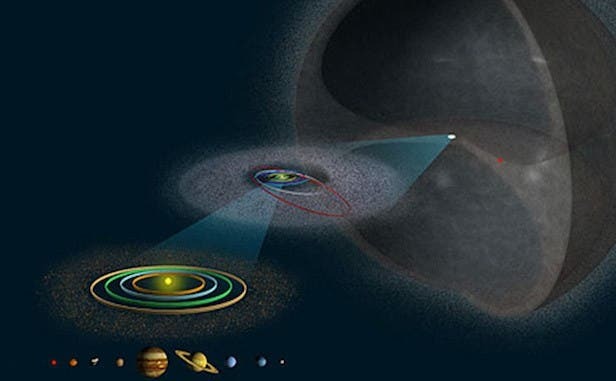 Subtler signs of the sun S influence are also harder to spot in the outer solar system. Characteristics of the solar wind including speed, density, and temperature – are shaped by the region of the sun it flows from. As the sun and its different wind-producing regions rotate, patterns form. New Horizons didn't see patterns as defined as they are when closer to the sun, but nevertheless it did spot some structure. Speed and density average together as the solar wind moves out said Elliott.But the wind is still being heated by compression as it travels, so you can see evidence of the sun s rotation pattern in the temperature even in the outer solar system. "The Voyagers can't measure these seed particles, only the outcome," said Christian. "So with New Horizons going into that region, this blank patch in the observations is being filled in with data." Since New Horizons is one of the very few spacecraft that has explored the space environment in the outer solar system, lack of corroborating data meant that a key part of Elliott's work was simply calibrating the data. Her work was supported by the Heliophysics Research and Analysis program. She calibrated the observations with pointing information from New Horizons, the results of extensive tests on the laboratory version of the instrument, and comparison with data from the inner solar system. NASA's Advanced Composition Explorer, or ACE, and NASA's Solar and Terrestrial Relations Observatory, or STEREO, for example, observe the space environment near Earth's orbit, allowing scientists to capture a snapshot of solar events as they head towards the edges of the solar system. But because the space environment in the outer solar system is relatively unexplored, it wasn't clear how those events would develop. The only previous information on space in this region was from Voyager 2, which traveled through roughly the same region of space as New Horizons, although about a quarter of a century earlier. "There are similar characteristics between what was seen by New Horizons and Voyager 2, but the number of events is different," said Elliott. "Solar activity was much more intense when Voyager 2 traveled through this region." Now, with two data sets from this region, scientists have even more information about this distant area of space. Not only does this help us characterize the space environment better, but it will be key for scientists testing models of how the solar wind propagates throughout the solar system. In the absence of a constant sentinel measuring the particles and magnetic fields in space near Pluto, we rely on simulations – not unlike terrestrial weather simulations – to model space weather throughout the solar system. Before New Horizons passed Pluto, such models were used to simulate the structure of the solar wind in the outer solar system. With a calibrated data set in hand, scientists can compare the reality to the simulations and improve future models. Our Voyage Through the Local Interstellar Cloud — "Different from the Chemical Make-up Our Solar System"
Changing Face of Saturn's Enceladus –The Most Habitable Spot Beyond Earth in the Solar System?